In this edition, John Griffiths addresses a number of Welsh rugby-related questions, as well as the Test side with the most graduates from the same school. The Welsh Leagues were officially launched in September 1990. Before that the Welsh Championship was an unofficial ranking of the first-class Welsh clubs based on their average record across all official matches played during the season. The Merit table, the second of the classifications you refer to, was restricted to results among Welsh clubs. For both systems, each match a first-class club played carried two points for a win, one for a draw and none for a loss. The average (actually a percentage) was the measure of a club's success over the season. The club with the best average was declared unofficial Welsh champion for the season. The Championship Table had appeared regularly in the Western Mail, Wales's national newspaper, since before the Great War. It should be pointed out, however, that the table was to some extent misleading because the clubs had fixture lists of varying strengths. This was particularly true with respect to meetings with English opponents. As a result, the clubs who did not meet the Bristols, Leicesters and Northamptons etc home and/or away were not subjected to such varied or demanding tests. The objectivity of the exercise also depended on the accuracy and completeness of the records available. From 1946 to the introduction of the Welsh Leagues the unsung hero who kept reliable records for the Western Mail was their staffman, John Billot, for whom the exercise was a labour of love. The phrase "Welsh Merit Table" filtering the results among the first-class Welsh clubs appeared around forty to fifty years ago but was not a new idea. The Western Mail had produced separate tables - the so-called Championship Table and their own All-Welsh Table - between the wars. Their method included only the results of matches that had been listed in the fixtures section of the WRU's official handbook for the season. The Rothmans Rugby Yearbooks and before them the Playfair Rugby Annuals listed the post-war seasonal records of the Welsh clubs. Before the War, rugby's "bible" was the Rugby Football Annual which ran from 1913 to 1939, though for three years (1923-24 to 1925-26) Wisden, the publishers of the famous cricketers' almanac, also produced expansive tomes devoted to rugby. Some sources give Cardiff (1924-25), Newport (1927-28) and Llanelli (1933-34) slightly better playing records than the champions listed above. Aberavon, moreover, finished above Neath in 1934-35 in the All-Welsh table based on matches in which Welsh clubs met each other. A further complication that should be noted is that between 1926 and 1931 there were five seasons when Cardiff fielded two "first" fifteens. It was the norm for publications to consolidate the results for the club's two teams. The value of a try was raised from three to four points at the start of the 1971-72 season. The last three-point try for Wales was scored by Barry John against France in Paris in March 1971. Wales won 9-5 and completed their first Grand Slam since 1952. J P R Williams scored their first four-pointer crossing at Twickenham in January 1972 in a 12-3 win for Wales. The try was upgraded to five points in mid-1992. Richard Webster scored the last four-pointer in Wales's 15-12 win against Scotland at Cardiff in March 1992. Ieuan Evans's match-winner in the 10-9 victory over Will Carling's reigning Grand Slam champions in February 1993 was Wales's first five-point Test try. It was also the first five-pointer to "make a difference" to the outcome of a Test match - the game would have been left drawn at 9-all under the previous scoring system. The WRU ditched the A team as a cost-saving measure after the 2002 A-Six Nations tournament. The old Five Nations had operated a full A-team competition in the late 1990s and the A teams participated in a full shadow Six Nations tournament for a couple of seasons after Italy joined the fray in 2000. The traditional Boxing Day fixture was a big attraction in West Wales in the years before the game went professional and the matches of the early 1970s, when the clubs provided the nucleus of the Wales (and 1971 Lions) teams, were a great draw. 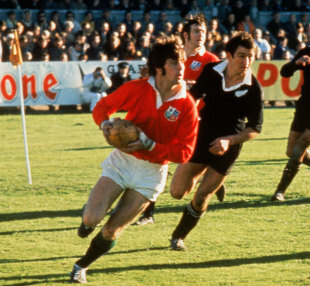 The 1971 match was played on Monday 27th December and London Welsh fielded a dozen Welsh internationals, including six members of the triumphant 1971 Lions tour side to New Zealand. As you say, the Welsh selectors (the Big Five) were in attendance. The day was damp and overcast but by the time the match started under floodlights Stradey Park was bursting at the seams. The sides produced a wonderfully entertaining match with the Scarlets running out 20-10 winners. Llanelli made frequent use of their young strong-running centre, Ray Gravell, early on and a pick-up from a five-yards scrum by Hefin Jenkins led to Gravell opening the scoring with a try that Andy Hill converted. A break by John Dawes led to a penalty kicked by J P R Williams before Mervyn Davies, standing off at a scrum, set up a movement that resulted in Keith Hughes crossing under the posts. J P R Williams failed with the easy kick, but the exiles held on to lead 7-6 at the interval. Llanelli regained the lead when Phil Bennett worked an opening for Roy Mathias to score, Hill converting, and further tries by Gravell and fullback Roger Davies gave the Scarlets an unassailable 20-7 lead. London Welsh put together a series of exciting attacks in the closing ten minutes but their only reward was a penalty goal kicked by John Taylor. Eight of the Boxing Day "trialists" featured when the Welsh selectors convened a couple of weeks later to name the side for the Five Nations opener against England at Twickenham: J P R Williams, Gerald Davies, Roy Bergiers, Barrie Llewelyn, Geoff Evans, Delme Thomas, Mervyn Davies and John Taylor. Rugby School (not surprisingly) provided ten pupils for the English team that lost to Scotland at Raeburn Place, Edinburgh, in March 1871 in the first-ever rugby international. The Old Rugbeians in the England side were: F Stokes (captain), A G Guillemard, A Lyon, J F Green, F Tobin, J H Clayton, A Davenport, J M Dugdale, C W Sherrard and D P Turner.